Have you ever broken anything? If you are like me, I am sure that you have. Usually when I break something, I will cast it aside and throw it out. And I am sure you do the same. But why do we discard broken things? We do so because we see the broken item as useless. But that is not the case in Scripture. Oftentimes, God intentionally uses something broken by His grace and for His glory. Let us ponder together the beauty found in God’s use of broken things. Do you remember the story about the man who could not walk and was brought to Jesus while lying on a cot? Four dedicated friends broke up the roof of a home in effort to lower their paralytic friend to Jesus (Mark 4:2). And how could we forget the classic example of a broken vessel? Mary in worship to our Lord broke an alabaster box of precious ointment to anoint His feet (Mark 14:3). Jesus even demonstrated the beauty of brokenness when He broke five loaves of bread to feed a hungry crowd gathered on a hillside (Matthew 15:36). And when He instituted the Lord’s Supper in the upper room with the disciples, He said that the bread symbolized His body which was given for them (Luke 22:19). Furthermore, when Jesus was crucified on the cross, the veil of the temple was torn from top to bottom – something that could only have been done by the very hand of God (Matthew 27:51). And as God the Father broke the veil, it symbolized that His Son Jesus Christ was the ultimate and final sacrifice. Now mankind could have direct access to the God Father through God the Son. As we leave the gospels and go a bit further into the New Testament, we find other examples of how God uses broken things. For example, the apostle Paul and his companions survived a shipwreck by clinging to the floating debris of their broken boat (Acts 27:44). And in the book of Revelation, it was the Lamb of God who broke open the seven seals to reveal the coming Judgment of God upon the earth (Revelation 6-8). But the beauty of broken things within the Word of God is not limited to the New Testament. There are many Old Testament examples as well. In our passage above Gideon’s army of three-hundred men intentionally broke their water pitchers as they confused their enemies and experienced victory (Judges 7:19). Moses broke the tablets of the Ten Commandments. Yet despite Moses’ anger, God used that moment to accomplish His purposes (Exodus 34:1). In David’s great confession of sin in Psalm 51, he expresses a broken and contrite heart (Psalm 51:17), a reminder to us all that we must be broken over our sin to be in right relationship with God. Finally, how can we reflect upon the subject of brokenness in the Bible without considering that great messianic prophecy known as the Suffering Servant recorded in Isaiah Chapter 53? The Bible tells us that He was crushed (broken) for our iniquities (Isaiah 53:5). From our perspective, the least usable tool in a toolbox is a broken tool. But that is not God’s perspective. Oftentimes more than not, God reaches His sovereign hand into His toolbox and intentionally chooses to use a broken tool to accomplish His purposes. 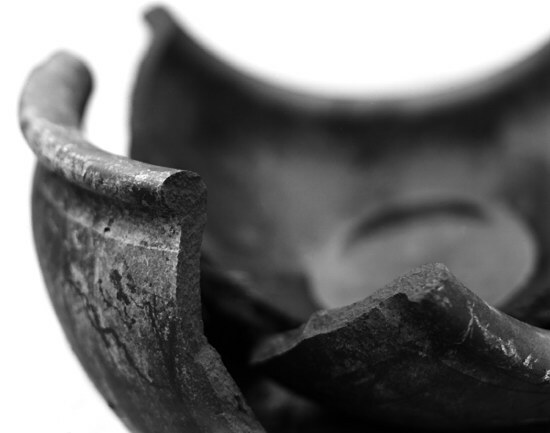 We must remember that God cannot use a dirty vessel but only a broken vessel. This truth is somewhat paradoxical in nature; for the more we are broken, the more usable we are to God. It means that we are much like Mary’s alabaster box; we can only be used when we are broken. Oh that we would be broken vessels spilled out in worship to Him! We all know that God uses the broken for good. He uses those who have been hurt for His purpose. We have to be a willing vessel for Him to use. He loves us to much to leave us broken. Many times in our lives we look down upon broken things. When something is broken we look to replace it as soon as possible with an equivalent or something even better. How often do we take the time to heal our very own broken lives? We are constantly falling and breaking down and yet we choose to not do anything about it. We should always look to God, and when we slip even just a little we should be ready to get back up and conquer what was troubling us. If God did not want to youse broken thins then we wouls be useless. We all have fallen short of the glory of God so that means we have been broken. I mean to me its amazing how God can use broken things to show his love. Also he could make us broken to humble us so that he can use us to help other people in their brokenness. This is absolutely true. I’ve seen and heard plenty of stories of broken people truning around and doing great things for people, and it really brings glory to God when you look at where somebody was and where they are now. The way God uses broken people to do his work is truly amazing. It not only serves to show his power but also keeps us humble. When we see God using the broken it reminds us we are no better than anyone else and we are all “the least of these”. I often try to act like everything is fine in my walk with God because I am too ashamed to admit that it’s far from perfect. I guess I fail to realize that everyone has issues and struggle in some way. By human nature, I assume if I’m struggling, I’m going nowhere when in fact I’m making the most substantial growth. Everyone has probably been broken before. Everyone has had problems and issues in their life. I think that is wonderful to think about the fact how God uses broken things and broken people for his will. It makes us seem less useless, and might be what we needed to hear to get through a tough time. It is simply wonderful that God can use anyone to accomplish what he wants. Whenever I feel broken, I feel like I am not capable of being used by God. Wow is that thought process wrong. When I’m broken, that’s exactly when God DOES use me. He shows us His sovereignty through this. In situations when we would just give up and start over, God does something miraculous. He is so amazing. We try to push aside things that are broken and are torn in our life. Then we forget about them . We need to put the broken “object” in front of us and not hide it but try to fix it and help it because we see in scripture that God uses broken things sometimes to help some situations. The way God sees our broken nature but still loves us and forgives us of our shortcomings is amazing. God uses everyone for his will and the fact that he uses broken people as well is truly a reason to worship Him. God really does use broken things to bring him glory. Andrew Winfrey is a great example. He was a young leader in our youth group and was in a terrible crash. He lost most use of his motor skills and can’t even walk, but he can speak. He has now reached so many more people through his testimony and it is amazing. I think we often forget that God can use even the most broken of things. That’s why he can use us. We are really more broken than anything in our sins. Aren’t we blessed that he doesn’t just throw us out? I think it is awesome how God uses broken things. It just proves God has a use for everyone and everyone has a purpose in this world. I personally find it encouraging that God uses broken people. Even some of the most Godly people we know today use to be broken, but he still used them and he is using us. It shows me that no matter how bad someones life use to be, or what they use to do that he still takes them and puts them back on the right track. Some of the most Christ devoted people I know came from a rough back ground. It amazes me that God still forgives you and uses you even if you are broken. Whenever I am broken, I come back twice as strong. God amazes me every time he uses me. Sometimes even the smallest of things that he does can comepletey change my outlook on things. His grace is amazing. This says it all very well. We are broken creatures and we break easily. We all sin and keep on breaking Gods rules. How is it that we don’t go out and try to fix ourselves. I bet if our tv went out during a football game, we would all try to race to town as fast as possible for a replacement. Why is it then that no one cares about ones self? Perhaps we are just to arrogant and need God a lot. God has taken our brokenness and turned it into something that only makes Him greater. If we were perfect, we would not need a Savior to redeem us. But even though we have been separated by our own actions, God has given us the chance to progress back toward our original design by sanctification through His grace. What a beautiful salvation He brings to us broken beings. It is amazing to me that God can put all of our brokenness aside and love us regardless of the mistakes we have made. I am very blessed to have a God that loves me as much as He does. I am guilty of throwing away broken things because they are useless once I break them, but we are all sinners and we are broken and God still loves us.